Tiger Fitness Inc. has experienced rapid growth in the fitness and nutritional supplements industry through their innovative product offerings, incredible online content resources and sharp marketing. At its core, Tiger Fitness is dedicated to providing excellent customer service and value. Through the Magento 2 Enterprise platform, Tiger Fitness is aiming to provide the best eCommerce service available through a fast and user-friendly website. 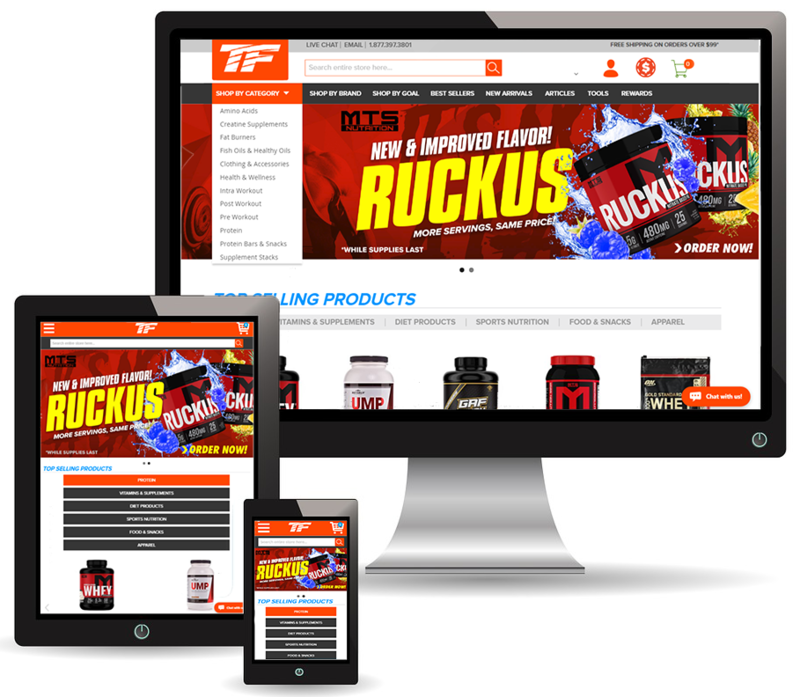 Tiger Fitness came to InteractOne needing a new solution for their eCommerce site, TigerFitness.com. They were operating on Volusion and the site lacked the ability to properly customize the front-end and could not support their growing need for scalability. In addition, the site had many poorly formatted pages, hard to use interfaces, a convoluted catalog structure, and slow page loads. Tiger Fitness needed a platform that was fully customizable, easy to integrate, scalable, and user-friendly. InteractOne successfully migrated Tiger Fitness from Volusion to Magento 2.1 Enterprise Edition. The new site includes a new custom designed theme with frontend user interface design wires, design style and design coding. Various extensions were implemented to further enhance Magento’s features. Extensions in the build included Customers Who Bought This Also Bought, Help Desk, Social Login, Bundle Promotions, Amazon Payments, and Bootstrap support. We also provided custom development to enhance the Rewards Points and RMA functionality in Magento. In addition, we added a blog extension and migrated their WordPress blog to Magento. Other noteworthy work we performed included managing the migration of Orders, Customers, Catalog and Gift Cards data. In addition, advanced search capabilities were implemented to allow customers to search both the catalog and blog articles from the main search area. Notably, we also assisted Tiger Fitness in their integration with Stone Edge warehouse management system and added optimization to ensure fast loading pages. Finally, we provided training to the team so they are able to manage day-to-day activities via the controls found in the Magento admin. With their new Magento 2 Enterprise Edition website, Tiger Fitness has the speed and flexibility of Magento 2.1 Enterprise Edition as well as properly integrated custom development. Additionally, we were careful to use features that would allow the client to make changes and adjustments without involving a programmer. In the future, Tiger Fitness will be able to update or patch Magento as necessary without fear of disabling features or weighing down the site. With a faster, cleaner design on the M2 platform, Tiger Fitness is primed for success. In fact, since the new site launch in October 2017, Tiger Fitness has experienced exceptional growth in many areas. Notably, they are now seeing up to a 35% increases in year over year promotion sales. With the new scalability of the Magento 2 platform, the site can handle an influx of customers that just wasn’t possible on Volusion. If you are interested in learning more about how InteractOne can help you migrate from Magento 1.x, another eCommerce platform or from Volusion to Magento 2 please contact us or call 513-469-3345.